When Lord Randolph Churchill emerged as the leader of the movement for Party democracy in 1883 and 1884, Salisbury set his face against anything that he considered liable to fetter the complete independence of parliamentarians, as famously enunciated in Edmund Burke's 1774 address to the electors of Bristol. He was not about to allow parliamentary sovereignty to be circumscribed by caucuses of Party bureaucrats, let alone rank-and-file Party members. Control of Parties from outside Parliament both seemed to Salisbury impractical as it could not take into account the fast-moving mood swings of the Commons chamber, and repugnant in a Constitution in which an MP was expected to represent his whole constitutency, not just that part of it which voted for him. There were, therefore, philosophical as well as practical considerations why Salisbury and Churchill were set upon a collision course. It is an interesting and unexpected use of the term parliamentary sovereignty, which is not usually applied to the relationship between MPs and other party members. There are also other issues. Edmund Burke was talking about whether MPs should represent their constituents' wishes or vote according to their conscience and view of what was best for the country. But, undoubtedly, it is important to recall that an MP must, if he or, these days, she is to represent directly the constituents, it must be all of them. Then again, should the said MP remain in thrall to those constituents, anyway? Probably, if a re-election is sought, but that is a somewhat cynical point of view. Of greater interest is the role of the leaders of the party in parliament, who, also want to control MPs. What should their role be? Tory Historian can probably guess what the great marquess would have said but the whole issue remains unresolved with different groups emerging victorious at different times. Well, experimental it may be but the theme is not far off what this blog is about, which gives Tory Historian a good deal of leeway. Wandering round the British Museum, Tory Historian decided to take photographs of two of the choicest exhibits in one of the Greek galleries. 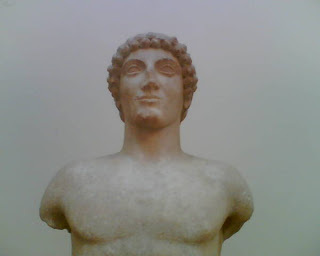 One is of the face of the Kouros, the young boy, that is probably from the 6th century BC, when, as the notice said, "when the conventional smile was replaced by a solemn pout, the facial expression of classical sculpture". Does one get the feeling that the curator is fonder of Archaic Greek sculptures than of classical ones? On this figure, though, the enigmatic smile is still present. 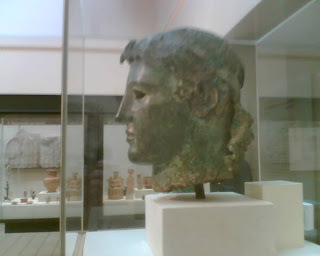 The other picture is of one of the earliest Greek bronzes, from the 5th century BC and probably from Cyprus, the head of Apollo. Tory Historian decided to take the picture in profile for no particular reason (not being a particularly artsy photographer). For all of that, the amateur photo seems to have more life than the official one on the BM page. Can't understand it. Normally they are much better.